Abandoned bicycles taking up valuable and limited parking spaces are to be more actively removed by Dublin City Council — a new policy set last month means tags will be put on the bikes first to warn users. The policy gives users of bicycle racks a large time window to remove bicycles:. 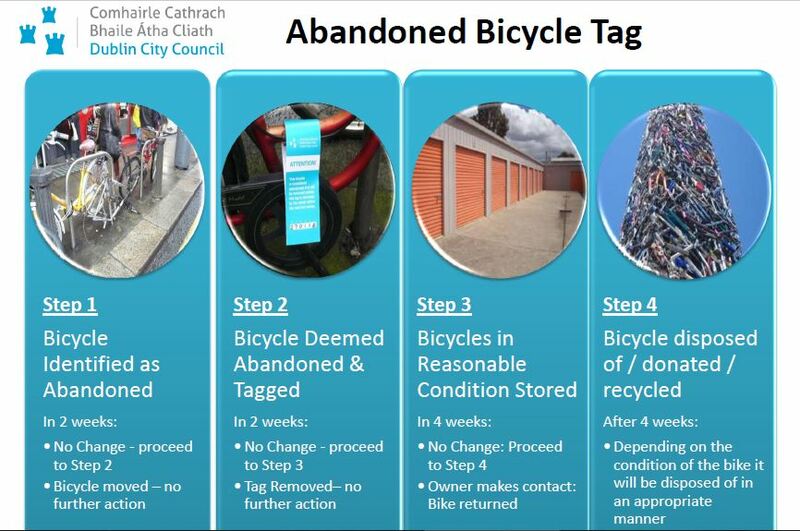 First there’s a two week monitoring time before a bicycle is tagged; and then, if the bike is deemed to be abandoned and tagged, another two weeks is given for the tag or bicycle to be removed. If the abandoned bicycle is in a reasonable condition after those four weeks, it will be removed and stored in a Dublin City Council storage facility for another four weeks before it is recycled, disposed of or donated depending on its condition. Bicycles in more of a scrap condition may not be stored for those final four weeks and are likley to be recycled straight away. “The demand for on-street cycle parking within Dublin City centre is growing as the number of cyclists increase. Abandoned bicycles take up valuable space that cyclists could otherwise be using. They are unsightly and can at time pose a hazard to other pedestrians and cyclists,” Sarah Scannell, the city council’s new cycling and walking promotion officer, wrote on cycledublin.ie. Cycledublin.ie is the council’s little-updated cycling website which Scannell has been tasked with updating more reguarlly. This is a great initiative by the council. Some frames are left lying around for months. Four weeks is more than enough time to move your bike. I like the idea of making unclaimed bikes available for someone who will get some use out of them. I’m sure the city’s student community would be interested. Definitely a good idea. Good move by the council. Great idea, if Án Garda Siochána took cycle theft more seriously there may be fewer bicycles with missing wheels clogging up parking spaces though!